The earth is only a few thousand years old. That’s a fact, plainly revealed in God’s Word. So we should expect to find plenty of evidence for its youth. And that’s what we find—in the earth’s geology, biology, paleontology, and even astronomy. Literally hundreds of dating methods could be used to attempt an estimate of the earth’s age, and the vast majority of them point to a much younger earth than the 4.5 billion years claimed by secularists. 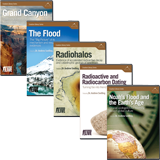 The following series of articles presents what Answers in Genesis researchers picked as the ten best scientific evidences that contradict billions of years and confirm a relatively young earth and universe. Despite this wealth of evidence, it is important to understand that, from the perspective of observational science, no one can prove absolutely how young (or old) the universe is. Only one dating method is absolutely reliable—a witness who doesn’t lie, who has all evidence, and who can reveal to us when the universe began! And we do have such a witness—the God of the Bible! He has given us a specific history, beginning with the six days of Creation and followed by detailed genealogies that allow us to determine when the universe began. Based on this history, the beginning was only about six thousand years ago (about four thousand years from Creation to Christ). In the rush to examine all these amazing scientific “evidences,” it’s easy to lose sight of the big picture. Such a mountain of scientific evidence, accumulated by researchers, seems to obviously contradict the supposed billions of years, so why don’t more people rush to accept the truth of a young earth based on the Bible? The problem is, as we consider the topic of origins, all so-called “evidences” must be interpreted. Facts don’t speak for themselves. Interpreting the facts of the present becomes especially difficult when reconstructing the historical events that produced those present-day facts, because no humans have always been present to observe all the evidence and to record how all the evidence was produced. Forensic scientists must make multiple assumptions about things they cannot observe. How was the original setting different? Were different processes in play? Was the scene later contaminated? Just one wrong assumption or one tiny piece of missing evidence could totally change how they reconstruct the past events that led to the present-day evidence. When discussing the age of the earth, Christians must be ready to explain the importance of starting points. The Bible is the right starting point. That’s why, when discussing the age of the earth, Christians must be ready to explain the importance of starting points and assumptions. Reaching the correct conclusions requires the right starting point. The Bible is that starting point. This is the revealed Word of the almighty, faithful, and true Creator, who was present to observe all events of earth history and who gave mankind an infallible record of key events in the past. The Bible, God’s revelation to us, gives us the foundation that enables us to begin to build the right worldview to correctly understand how the present and past are connected. All other documents written by man are fallible, unlike the “God-breathed” infallible Word ( 2 Timothy 3:16 ). The Bible clearly and unmistakably describes the creation of the universe, the solar system, and the earth around six thousand years ago. We know that it’s true based on the authority of God’s own character. “Because He could swear by no one greater, He swore by Himself” ( Hebrews 6:13 ). In one sense, God’s testimony is all we need; but God Himself tells us to give reasons for what we believe ( 1 Peter 3:15 ). So it is also important to conduct scientific research (that is part of taking dominion of the earth, as Adam was told to do in Genesis 1:28 ). With this research we can challenge those who reject God’s clear Word and defend the biblical worldview. Indeed, God’s testimony must have such a central role in our thinking that it seems demeaning even to call it the “best” evidence of a young earth. It is, in truth, the only foundation upon which all other evidences can be correctly understood! View an excerpt from the DVD Nuclear Strength Apologetics, which shows how to use scientific evidence properly when you defend your faith. 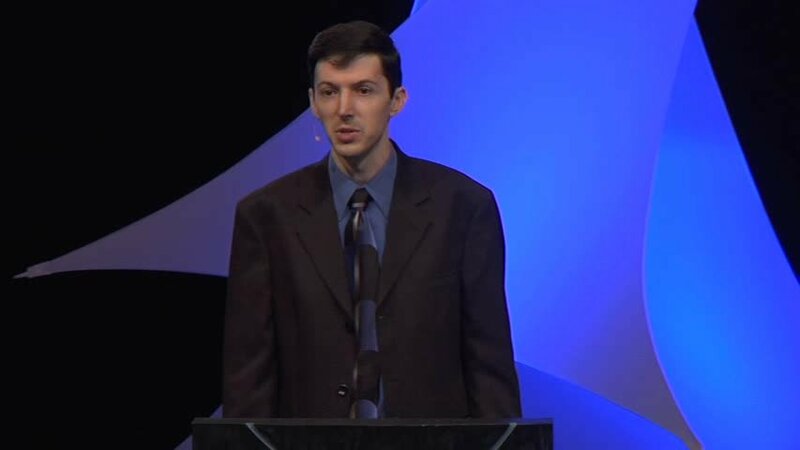 God’s Word clearly teaches that the earth is young, and the evidence powerfully confirms it. 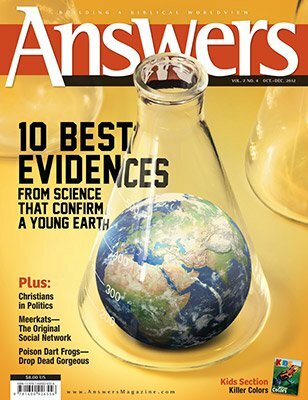 So don’t miss this issue of Answers, which brings you up to speed on the ten best evidences for a young earth. 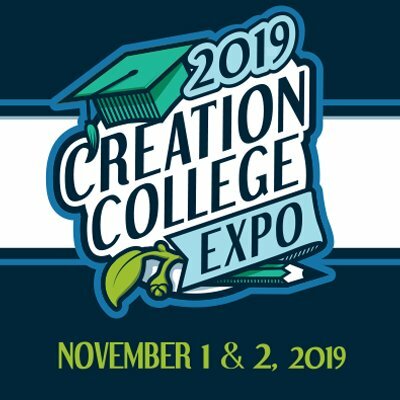 Also discover incredible new examples of the Creator’s undeniable designs, a biblical view on political activism, the latest findings on the Dead Sea scrolls, and much more! 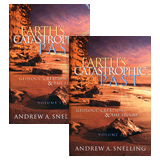 From Earth’s Catastrophic Past, Geology, Creation & the Flood by Andrew A. Snelling, 2009; published by the Institute for Creation Research, Dallas, Texas, copyright © 2009 by Andrew A. Snelling. Used with permission from the author.